Salesforce’s initial public offering in 2003 demarcated the beginning of a new era, the era of Software as a Service. In the 13 years that followed, many startups have followed their path to build innovative software that has transformed their respective industries and sectors. The shift has been revolutionary both in software delivery as well as sales. It’s not an understatement to say everything has changed. More than 15% of all software revenue is now generated by software as a service companies, and there are more than 50 publicly traded SaaS companies today. 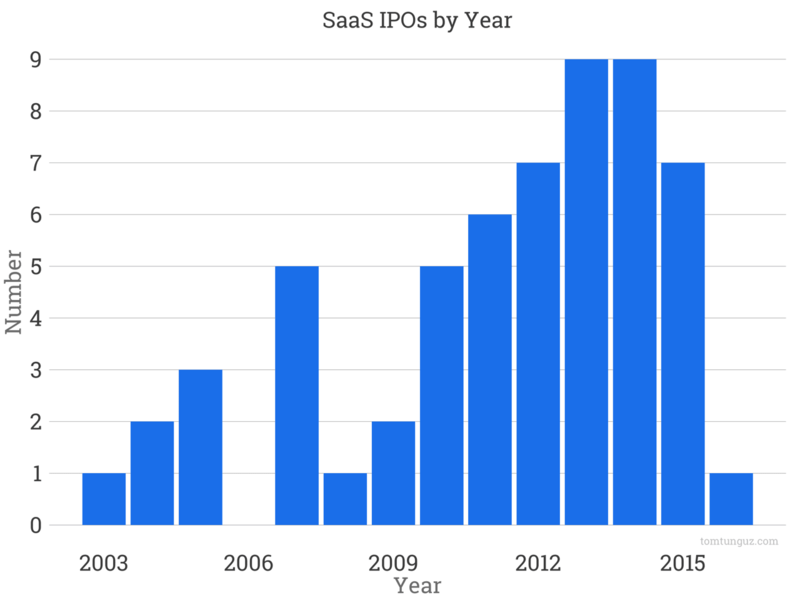 After more than a decade of reinvention, I was curious how healthy the IPO market is for SaaS companies. According to the data, 2016 has the potential to be the worst SaaS IPO year in six. The chart above plots the number of SaaS IPOs. In 2003, Salesforce kicked things off. By 2007 there were five IPOs and that number crested at nine in 2013 and 2014. The IPO market in the second half of 2015 was more challenging but still seven companies went public. So far in 2016, there is only one. In gross dollar terms, SaaS companies raised more than $1.5 billion in 2012, the highest mark ever. Since that scene is, the amount is fallen to $1.3 billion then to $1.1 billion and $0.6 billion in the subsequent three years. 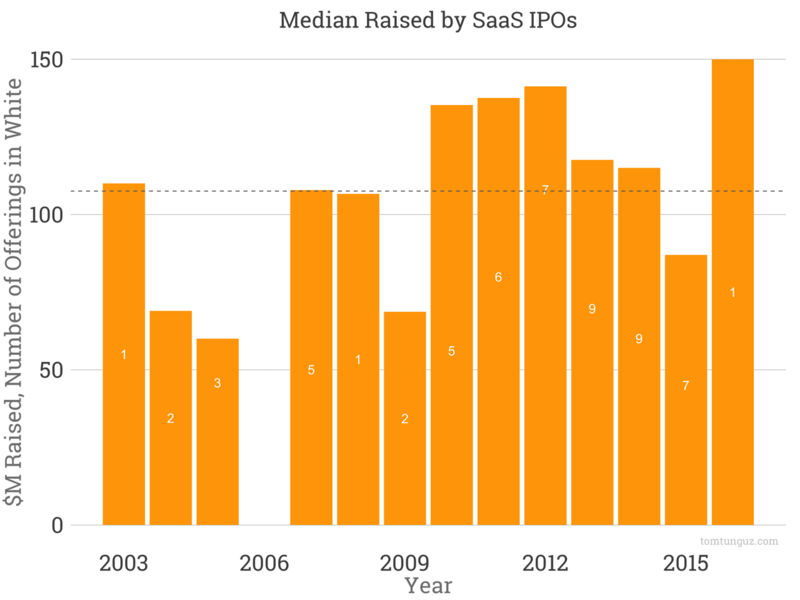 Throughout that turbulence, the median amount raised by a SaaS company going public has remained constant at roughly $108 million. Like any other sector, SaaS IPOs are affected by broader macro trends, and we’re likely seeing some of that in the number of offerings declining over the past 24 – 36 months. With the public market increasingly focused on near-term path to profitability, the financial profiles of pre-IPO SaaS companies may shift compared to the a few years ago in order to achieve those milestones. 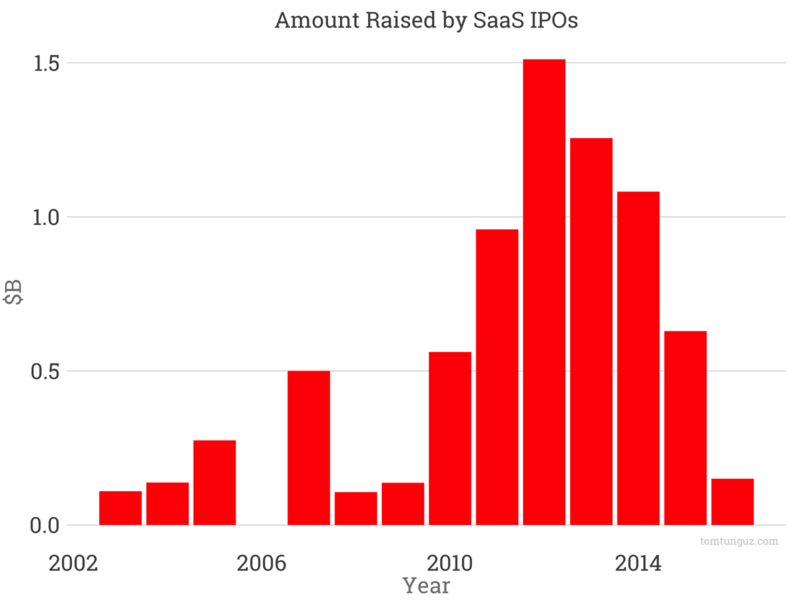 But, given the number of SaaS companies already at scale, I expect to see quite a few more IPOs or the next few years, that hopefully will reverse the trend of declining number of IPOs and amount raised.